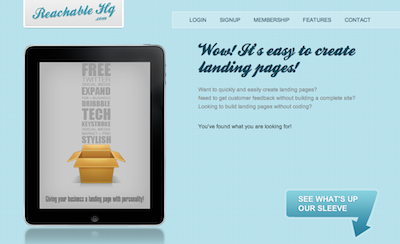 Reachable lets users to quickly and easy create landing pages without coding or design skills. Complete pages with contact forms can be created in less than 1 minute using our landing page generator. Building and testing landing pages for your PPC advertising has never been easier than Reachable. Want to quickly and easily create landing pages? Need to get customer feedback without building a complete site? Looking to build landing pages without coding? Reachable’s largest competition is people still spending time and money creating landing pages by hand.